What a strange journey this baby was! I found out I was “surprise” pregnant at about six weeks along. We always planned on having three, but wanted to wait another year. Keeping with the surprise theme, we decided to allow “Nugget” to remain a complete surprise. Because I had trained to be a Hypnobabies instructor, I also had the privilege to teach both of my friends Hypnobabies which was awesome. I followed along with their practice schedule this time since my husband was able to participate in the group class format and read half of the scripts. What a wonderful gift that turned out to be! His voice was instrumental in helping me during my pressure waves even more than my first Hypnobabies birth, Violet. This was the birth of many surprises. At seven months pregnant, I interviewed for a new job and was shocked to be hired. This new position occurred six weeks before Nugget’s arrival and allowed me to transfer my maternity care to the birth center. The week of Nuggets estimated arrival occurred and it was filled with a lot of practice birthing sessions which lasted about two hours. The week before she arrived I spent six hours overnight with regular birthing waves that got to seven minutes apart, but during the third rotation of the Deepening (Hypnobabies) track I fell asleep and woke up feeling great. Kevin and I discussed this, he told me that I was in my birthing time, that I was reading her message more negatively than she stated, and suggested that we do some pressure points for speeding up the process. An hour later, we had the same conversation with the midwife and decided to leave for dinner. It was very clear while I was trying to eat that this was it. I was nauseous, shaking and really struggling at the restaurant. We arrived at the birth center before the midwife came back from dinner and proceeded to walk around the parking lot. I was certain, but I wanted to speed things along for the midwife. When we went into the birthing center, I continued walking and Kevin and my mother continued applying the pressure points. Kevin had been using counter pressure on my back for the majority of the day as well. Between the hypnosis and the counter pressure there was no discomfort. I began to feel tired and we spent several pressure waves sitting on the birthing ball and listening to my playlist of Hypnobabies tracks. Kevin either waited for a signal from me or guessed when I need counter pressure. The midwife came in again. I really should have allowed Kevin and my mother to do all the talking because conversations with her were negatively affecting my emotional state. I cannot believe that I could fully know that I was having Nugget and somehow decide I wasn’t in my active birthing time. [Again…words easily affect birthing mothers right in the moment.] I agreed to be checked again and she told me that I was at 5 and then said she was going to stretch me to six. This was very uncomfortable. She said that it would increase my hormones. It took an hour for me to recover from this. 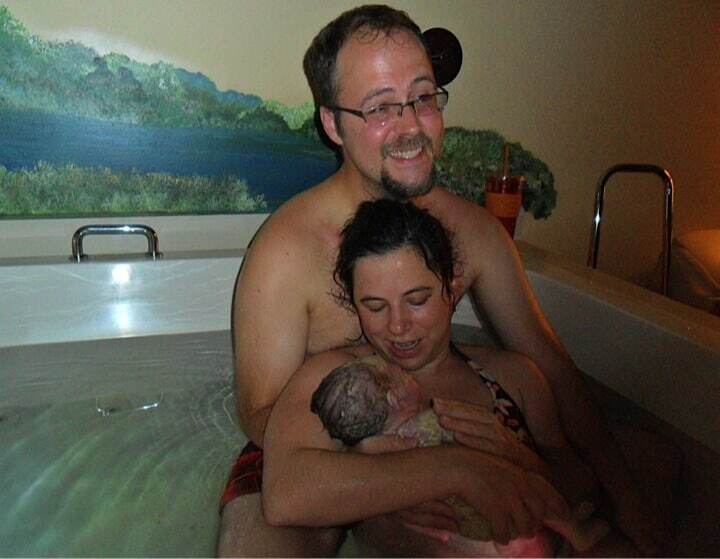 I include this here because this was my most uncomfortable time during my birth. In fact, I became comfortable again about an hour later. I spent the next hour, reminding myself to choose hypnosis while working through more discomfort than before and nausea. An hour later, we were in the tub at exactly an hour, but I really wish I had gone in sooner. For the hour I waited to get into the tub, I had to use my peace cue (strengthening anesthesia cue) constantly and my birth team constantly helped me by using the relax and release cue. As soon as I hit the water it became much easier. They still helped me a lot, but instead of catching up to the discomfort in the middle we were able to get it immediately. Almost immediately upon entering the tub, I was in transformation (transition). It felt wonderful. I was comfortable, the water felt great on my tired muscles, and the pressure waves were coming between 1 minute and 2 minutes apart. At one point I lifted my head and I said “I think I’m in transformation which is the best part because my baby will be here soon.” I then laughed because this is what the Hypnobabies scripts said I would feel. My body started pushing within an hour of getting in the tub. I think it was the first push that the midwife and my mother said that the baby was crowning and they could see the head! They tried to show me with the mirror, but I couldn’t curve around my body enough. At this point the mood in the room was really light. I noticed the nurse had arrived, Kevin was giving instructions for the camera, and the midwife was saying “I wouldn’t be surprised if she arrived before midnight, although, 7/7/2011 is a cooler birthday.” Kevin and I talked over each other to say “7/6/2011 would be fine with us.” Nugget and my body apparently agreed with the midwife. I pushed for another hour and then the midwife had my flip onto my back in the tub to check to see if there was a lip. This was difficult for me. At this point, I had the strangest sensation that my hips were flying away. My husband was amazing and was able to continue applying sacral pressure while squeezing the top of my hips which made a huge difference. The midwife said I had a lip and that with the next pressure wave she was going to hold it back. She told me to curve forward and hold my legs up. The next pressure wave came, she held the lip, I held my legs and then she had to remind me to curve which resulted in my letting my legs go. I just couldn’t seem to keep everything in my mind, but luckily that was all Nugget needed. Her head came halfway out with the same pressure wave. I was completely shocked that I could just stop with her head halfway out of my perineum with no pain just feeling really odd. I used the Hypnobabies method (of pushing in between waves to get the head out) and took a thirty second break and gradually pushed her head out and used the next pressure wave to do the shoulders. The midwife unwrapped the cord which was probably around her neck and handed her to us. We all forgot to check immediately, but she told us it was a girl. Eliza Katherine McNamara had arrived! During this birth, I knew that a first time mom was in the next room and I told the nurse that I was sorry I was so loud. She told me that I wasn’t loud at all. She also said that this was the first birth that she saw hypnosis work. She told me that she didn’t really need to do anything so she was just sitting down listening to the Pushing Baby Out track. She struggled with not falling asleep! Can you imagine? My birth was so relaxing that my attendants were falling asleep! Her first Hypnobaby’s birth story (Violet) is here.